Blurb: In the Readem and Reap casino on the edge of the Megaverse, Nightwind Ardian Cree may lose his life-mate with the draw of a card. Will luck be on his side or will he lose everything he holds dear? “Aye,” she said with a groan. “But I know something that would feel even better." 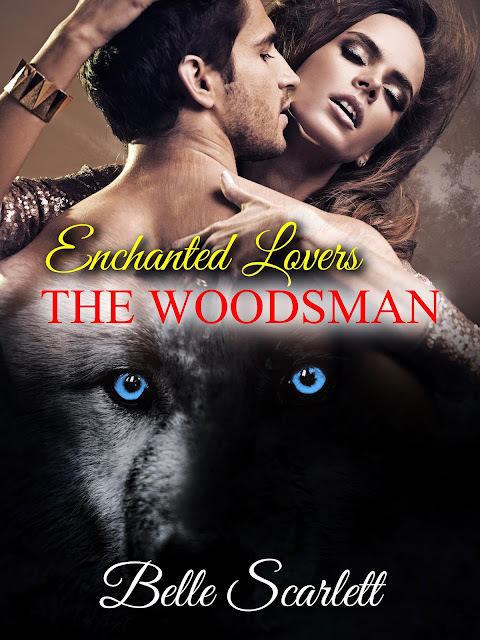 Thus opens the first title of my Enchanted Lovers series, The Woodsman, an adult-style fairy-tale in which the Big Bad Wolf is the winner. After he captures Lady Lily Rouge's carriage, Sir Marrok Ulfang, aka the biggest, baddest wolf the Enchanted Forest has ever seen, has only one day to win her heart and claim her first sexual surrender. Even if it means giving the nosey pixies fluttering outside his cottage window an eyeful. Otherwise, a wolf shape-shifter he'll stay, damned to remain in the lonely Enchanted Forest forever. As with any male, fiery-haired Lily learns the way to a hungry wolf’s heart is through this stomach. And what would a Red Riding Hood tale be without the heroine’s trusty, well-stocked basket of goodies to sustain her on her journey through a magical wood? 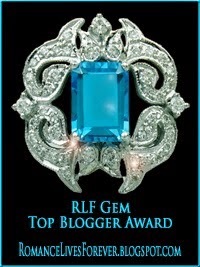 Lily returned her attention to the carriage window and scanned the inhospitable night. Nothing moved outside. Now was her chance. She took a deep breath and tried to open the carriage door. Fear made her stiff, chilled fingers clumsy as she fumbled with the handle. She needed something to stop her hands from shaking. She glanced around at the stacked pieces of baggage and plucked a flask of wine she spied poking through the opening of a lidded, woven basket that Cook had packed for her journey. Undoing the stopper, she tipped a healthy swallow down her throat. Dull warmth spread through her and burned her cheeks. All at once, she could not quite recall why she had been so frightened a moment ago. Tucking her liquid courage back into the food hamper that dangled from her elbow, Lily muttered an unladylike “Merde” and alighted from the carriage. Press cloves into the peel of quartered orange. Bring to a simmer over medium heat (but do not boil). Reduce heat to low, cook 30 minutes. Pour into festive glass mugs. Garnish with a cinnamon stick and/or orange slices. 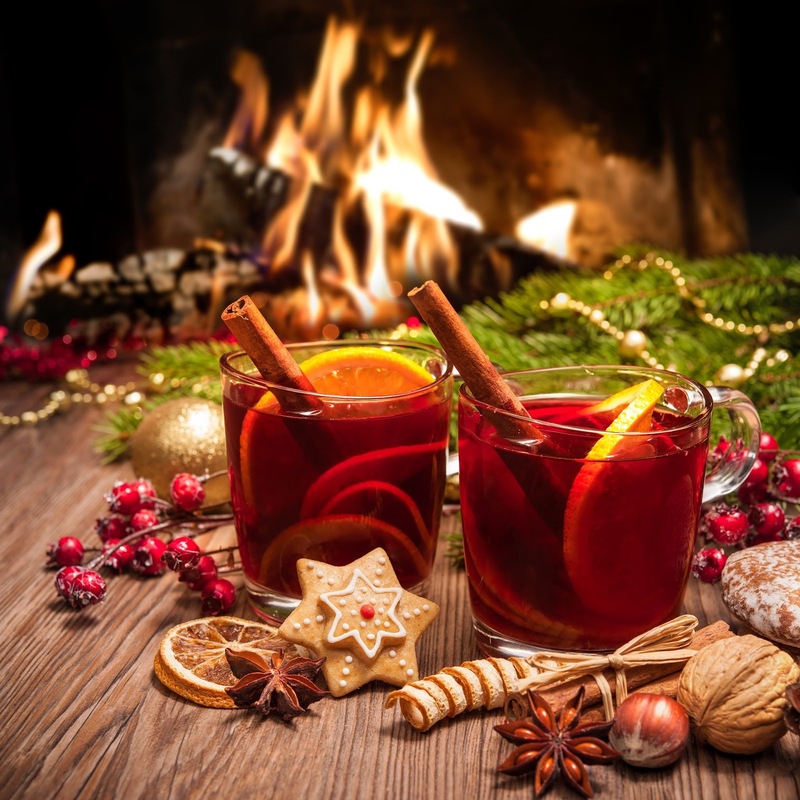 Note: You can make this more boozy if you like ~ it all just depends whether your inner-wolf is feeling naughty or nice. All during her trek through the wood, Lily had kept a death grip on the food hamper. It was the only connection to the civilized life she had known mere hours ago. Now, as delayed reaction set in, she unsteadily opened the basket and uncorked the wine bottle for another bracing swig. Then two more gulps. Fresh warmth doused her insides, relaxing her jangled nerves. Wiping her mouth with the back of her hand, she glanced out the window. Her wolf promptly curled up in front of the threshold and appeared to sleep. For want of anything else to do, Lily turned to survey her surroundings. The fireplace hearth glowed softly with a few dying embers from a cook fire that must have been lit early in the day. A pot with the congealed remnants of a venison stew hung on the spit hook. Note: This dish has a lot of ingredients but so worth it and it’s not that labor intensive once you’ve gathered all the goodies together. This can be made with shorter cook time in a cast iron Dutch oven, but I love tossing all the ingredients into my slow cooker and letting it have its delicious way with the tender succulent chunks of stew meat and veggies. 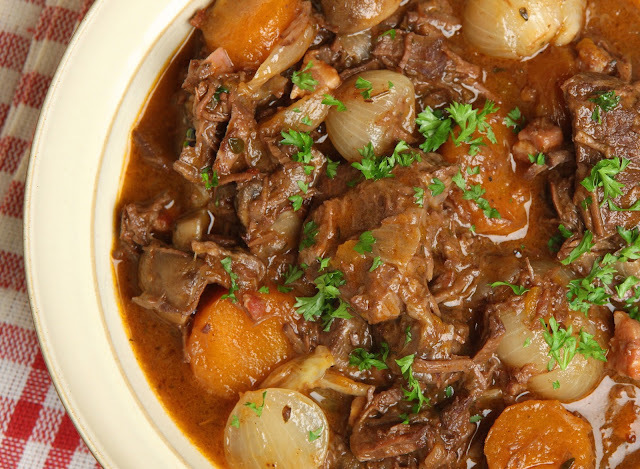 This hearty stew is comforting and so satisfying after a day spent playing out of doors in the cold. You can substitute elk or beef stew meat if you can’t find venison or still think of it as “Bambi’s Mom” (!) as one of my nieces refers to deer meat. Layer first 14 ingredients in an electric slow cooker, placing the food that takes the longest to cook on bottom. Combine flour, 1/8 teaspoon salt, and 1/8 teaspoon pepper in a shallow dish; dredge venison in flour mixture. Heat oil in a large nonstick skillet over medium-high heat; add venison. Cook 4 minutes or until browned on all sides, turning frequently. Work in batches if necessary. Add venison to slow cooker. Pour beer and broth over venison. Cover and cook on low 7 1/2 hours or until meat is tender. If you and your wolf pack don’t gobble this all down, you can freeze in airtight containers for up to 3 months. When re-heating just add in a little more water or beer. Serving size is about 1 1/2 cups; yields 6 servings. I hope you enjoy these seasonal goodies from Lady Lily’s basket! Enjoy all your winter feasts! Military Heroes -Thank you Veterans!